jalapeños stuffed with cream cheese. cookies stuffed with more cookies. burgers stuffed with cheese. cake stuffed with curd. avocados stuffed with eggs. 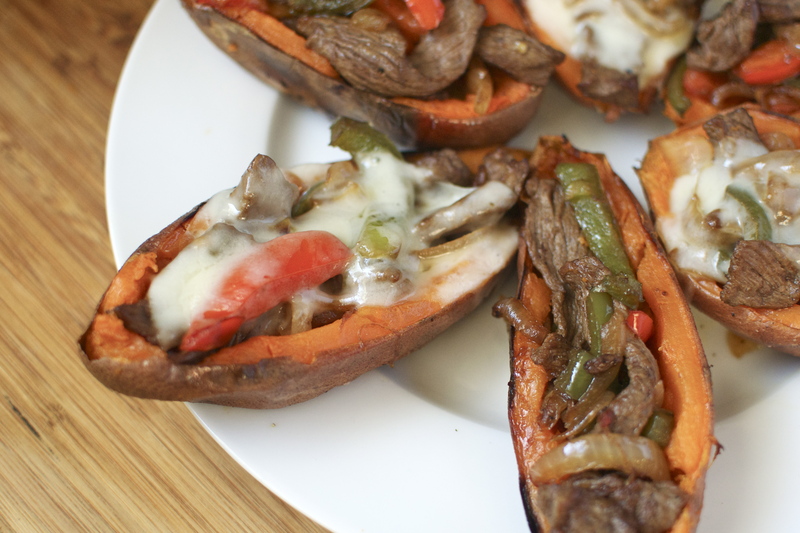 So, I made these in preparation stuffed sweet potato skins for the Super Bowl. if you’re mad about that little tickle in my throat, make these and you’ll feel less mad. nobody can be mad while stuffing her face! Preheat oven to 400 degrees. Poke the sweet potatoes all over with a fork and place them on a sheet tray lined with foal. Bake in the oven for about 45 minutes, until tender. Remove from oven, cut in half, and let cool. **When you put the potatoes into the oven, go ahead and put the steak into the freezer. It’s MUCH easier to thinly slice when it’s chilled! When the potatoes are done, remove the steak from the freezer and slice very thinly against the grain. In a large skillet, melt 1 tbsp butter over medium-high heat. Add the peppers and onions to the pan and season with a pinch of salt and pepper. Cook about 10 minutes, until they are softened and cooked down. Push the peppers and onions to one side of the pan. Add the steak to the empty side, season with salt and pepper, and cook only until just cooked through, about 2 minutes. Add the remaining ½ tbsp butter, stir the steak together with the pepper and onions, and remove from heat. Scoop out the sweet potato flesh, leaving about of ½ inch of potato all around the skin. 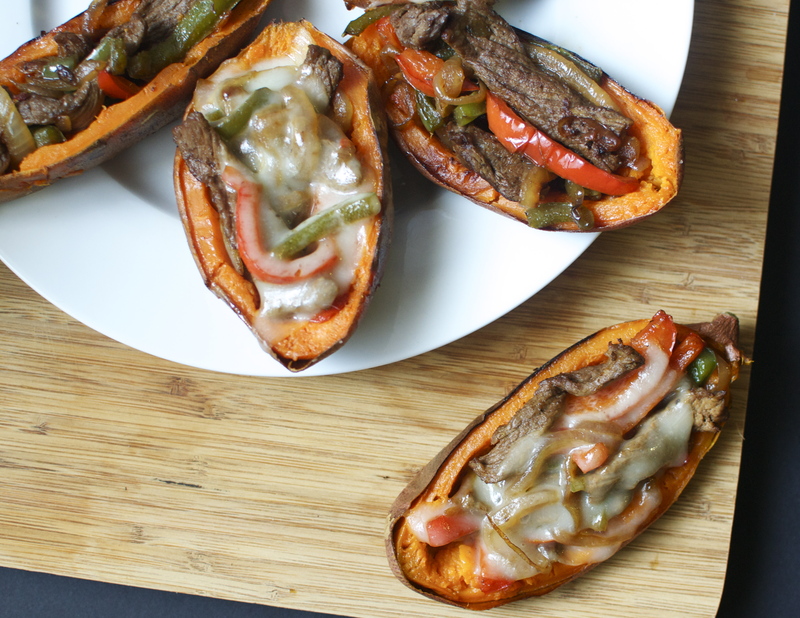 Reserve the scooped out sweet potato for another use. Place the skins upside down on a sheet tray, brush the outsides with butter, sprinkle with salt, and bake an additional 5 minutes. 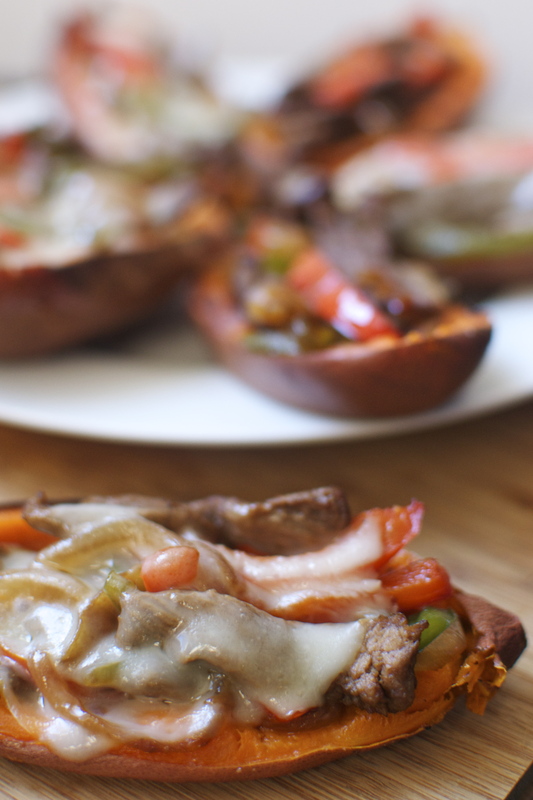 Flip the sweet potato skins over, brush the insides with melted butter, sprinkle with salt and pepper, and bake 5 more minutes. Remove from oven and set aside. Turn oven to broil. Divide the steak mix evenly between the 8 skins. Top with provolone (if using) and put the skins under the broiler just long enough for the cheese to melt, about 3 minutes. I would still do this step if omitting the cheese! Remove from oven and stuff into your face. You don’t like pizza ?! haha wish I could say the same thing 😜 thank you so much !! you are such a sweetheart 🙂 xoxoxoxo have a marvelous week love! Omg these actually look amazing!! 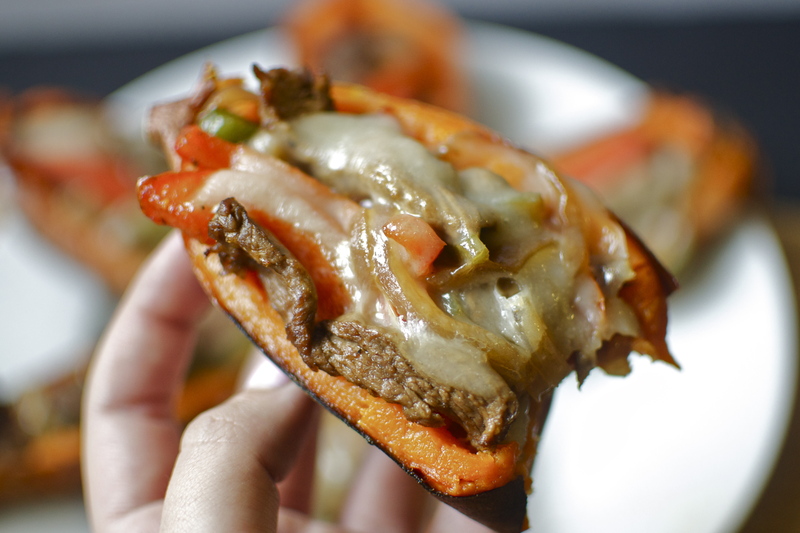 These look awesome, I love Philly cheese steaks!! I’d have to agree, the best part of the Super Bowl is definitely the snacks! (the Eagles aren’t playing, so I lost interest in football) Theres nothing better than a bunch of bite sized/finger foods to snack on while watching the game. I’m a duck fan!!! That means I watched the Eagles all season to keep an eye on mr. Chip! haha, can’t wait for the munchies! !